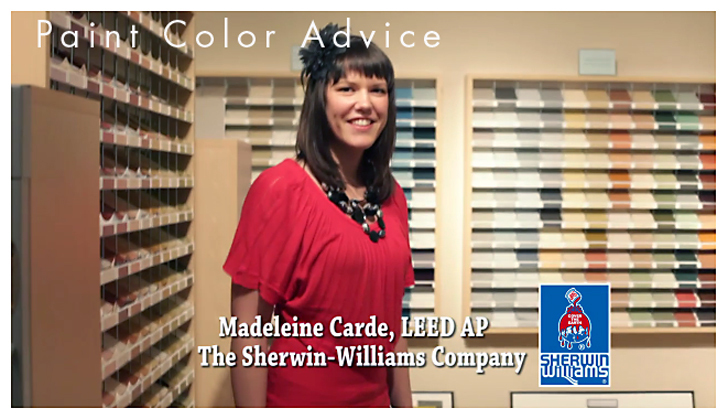 Thank you Madeleine Carde LEED AP, of the Sherwin Williams company for this paint color tip from her showroom at the Seattle Design Center. 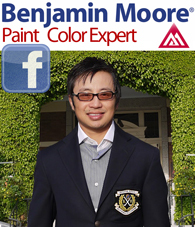 Interviewer: I have a question for you: If a homeowner needs help picking up color for the exterior of their house, what would you recommend? Madeline: Well, after picking out your paint chip, and kind of narrowing down your color choices, I highly recommend getting a Color To Go quart which we have, which is $4.99 a quart, and painting the side of the walls, especially doing it on each side, then you’ll notice how that color is going to change under the sunlight – North, South vs. East, West, in shady and non-shady areas. 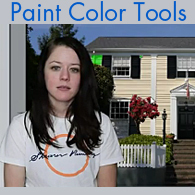 Interviewer: So the color will look different on different sides of the house? Madeline: Yes. That’s why it’s good to always paint little swatches on each side, just a nice little square. So that way, you can take into account how that green might change a little bit more to the yellow side or maybe it’s going to look a little bit grayer on the other side of the wall. And you’ll save a lot of money in the end. Interviewer: How large of square do you think? Madeline: Oh that’s a good question! I would definitely maybe do a 2ft x 2ft might be an appropriate size?